I had successfully put off re-setting the neck on one of my 1975 Guild F-212 12 strings for several years. I didn't take it out of it's case very often, anymore, as the action was too high to be comfortable. The saddle had been lowered beyond acceptable limits for years. 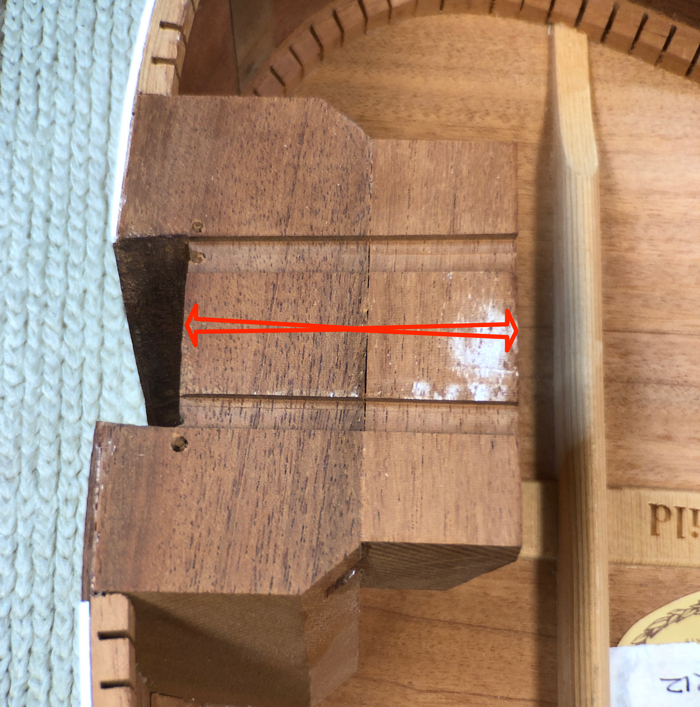 It was to the point where the (already shaved) Brazilian Rosewood bridge would need to be planed down so low in order to maintain any semblance of break angle on the strings that there would be insufficient mass left in the bridge to set the top in motion. In my experience, heavily-braced acoustic guitars such as these older Guilds sound perfectly awful with thin bridges. The day of reckoning had come - this Guild needed a neck reset. But, as with many of these projects, it didn't stop there. After all, why should I simply reset the neck and get back to all the other projects awaiting me? As you will see, there was an opportunity to spend way more time on this guitar than I had originally intended...and I took it! 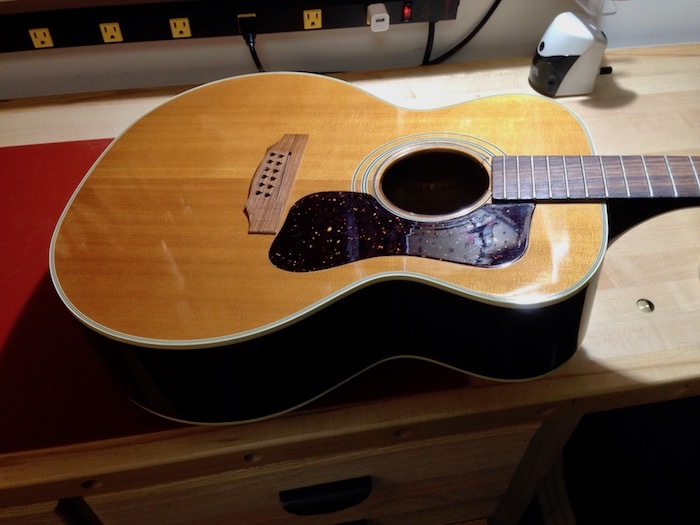 At a glance this Guild was still in remarkably good shape for a 40-year-old guitar. Further inspection, however, revealed issues I knew I had to deal with. 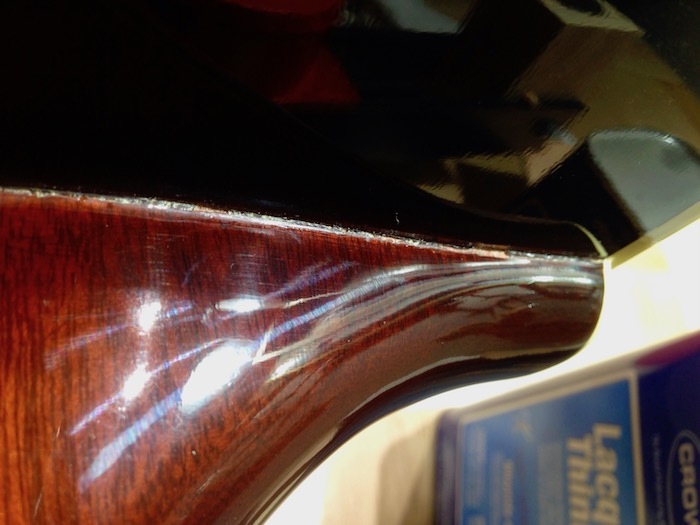 Cracks in lacquer finishes often are the result of the sudden exposure of a warm guitar to very cold temperatures. Actual cracks and splits in the wood are either the result of impact damage (accidental or otherwise) or extreme humidity or moisture conditions. 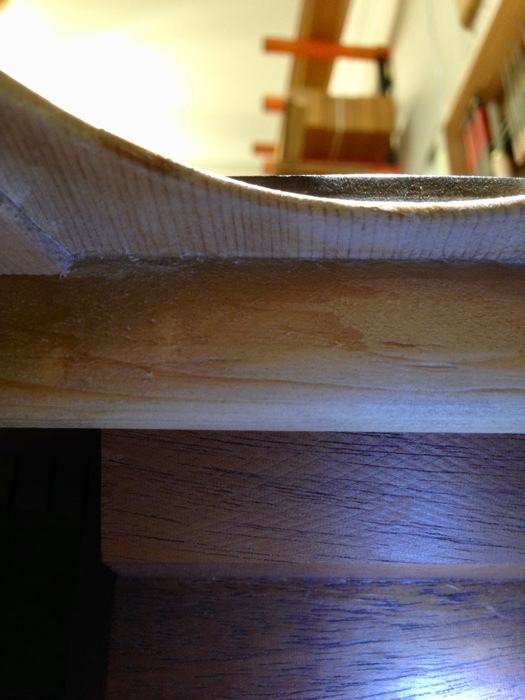 I have no idea when it occurred, but the dreaded soundboard/soundhole shift occurred at some point in recent history, splitting the top along the "bass" edge of the fingerboard extension from the neck heel to the edge of the soundhole. It wasn't grotesque, but it was noticeable, and it identified a larger underlying problem: A neck block should never shift. If it does, it is likely due to glue failure. 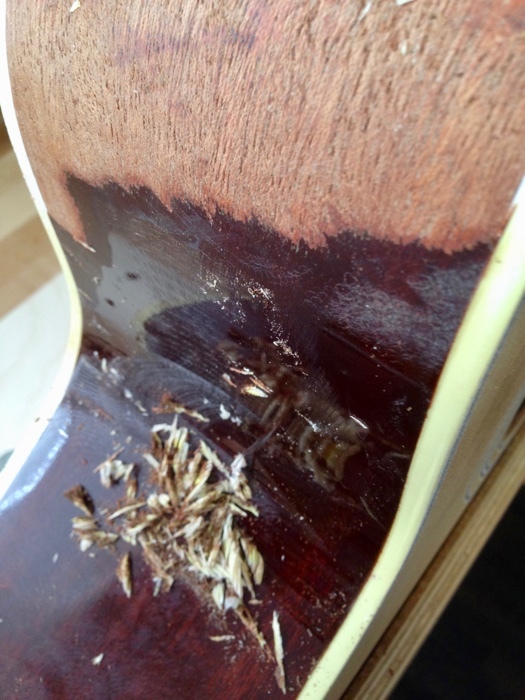 Glue failure can occur for a number of reasons, perhaps the most common being a combination of heat and string tension, such as when a guitar is left in a hot car. 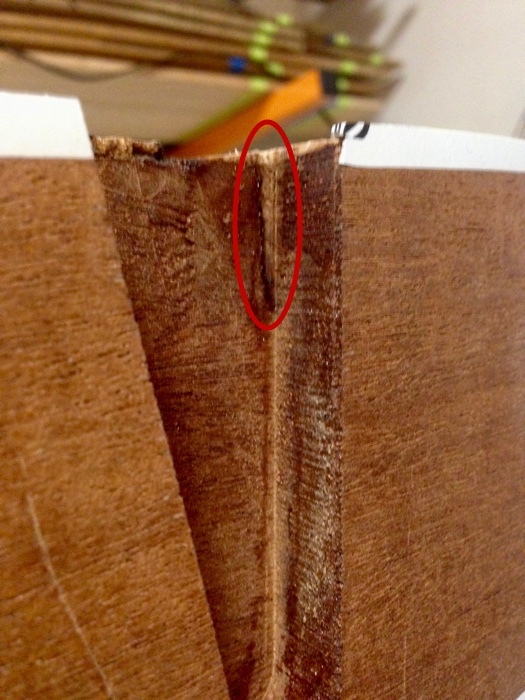 Glue failure is not necessarily obvious; in fact, adjoining pieces of wood can appear perfectly glued and yet a split may still have occurred. 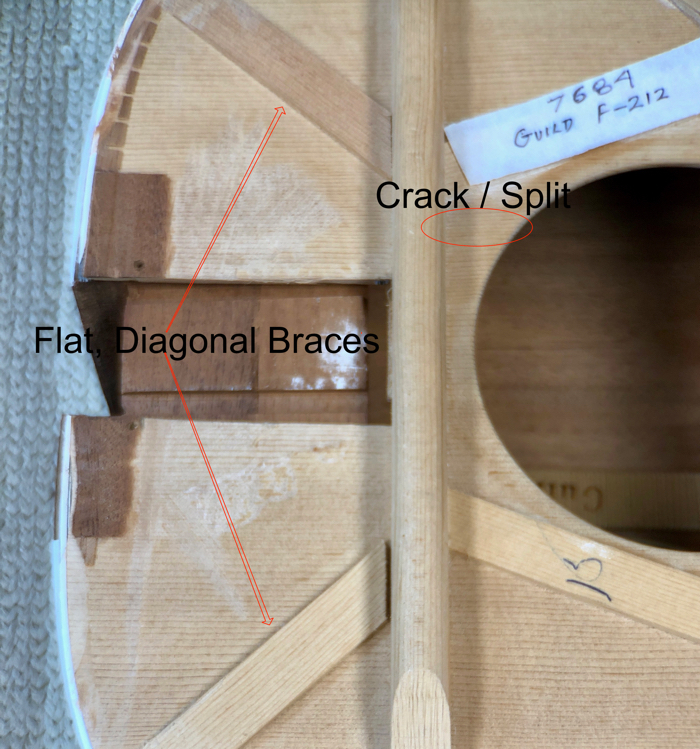 In addition to a neck block letting go, another factor that can be responsible for a soundboard split is the shifting of the entire upper bout, where the upper bout above the soundhole tilts forward/inward or to one side. Such a shift could occur as the result a sudden jolt (which may indicate insufficient support), or also be the result of glue failure. Lastly, splits and cracks can and will occur under humidity extremes, where pieces of wood are restricted in their ability to swell and/or contract, having been glued in place. These guitars were constructed without using a fingerboard patch, a thin horizontal strip applied to the backside of the soundboard just behind the transverse brace and extending across the width of the upper bout. Instead, a small block was added to the front of the neck block, narrower than the neck block and wider than the fingerboard extension. While this extra buttressing would counteract the tendency of the fingerboard extension to depress the soundboard, should the neck block ever shift forward it would take that section of the soundboard along with it. Thin, flat braces were glued to the underside of the soundboard, running diagonally from the transverse brace near the neck block out toward the the centers of the shoulders of the upper bout. It is interesting to note that when a soundboard split along the fingerboard extension occurs in one of these guitars, it always happens along the edges of the fingerboard between the fingerboard and the diagonal brace(s). The fingerboard is made from a very dense hardwood (Brazilian Rosewood, in this case). 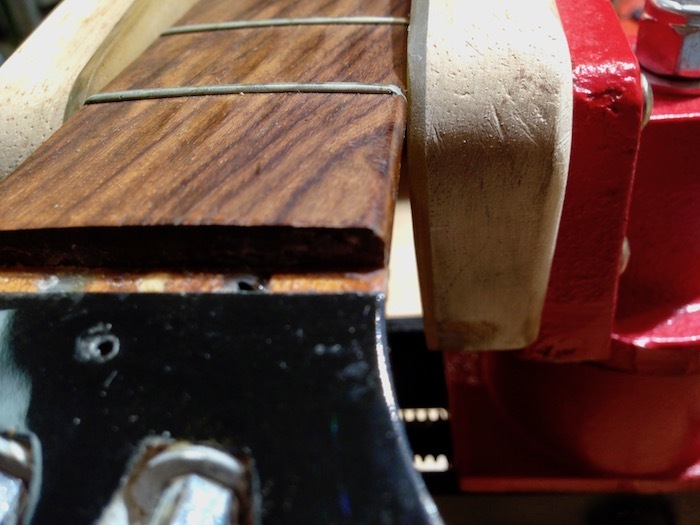 The grain direction of the fingerboard runs lengthwise from the headstock, down the neck and out onto the soundboard. It will expand and contract from side-to-side when exposed to moisture variations. The fingerboard extension is glued down to the Spruce soundboard beneath it. 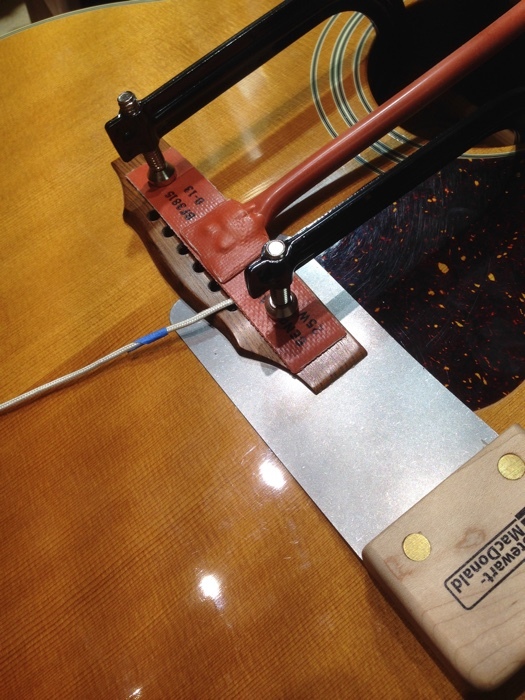 The grain direction of the soundboard also runs lengthwise, and it will also expand and contract from side-to-side when exposed to moisture variations. The soundboard is glued down to the neck block. 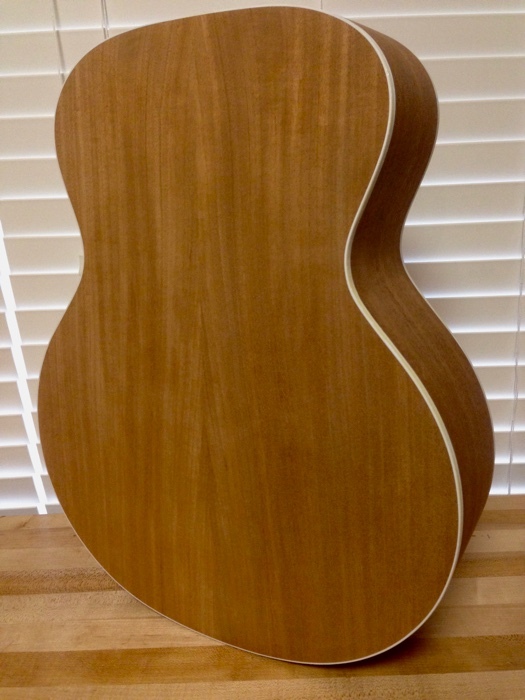 By contrast, the neck block's grain direction runs from side to side, rotated 90° to the soundboard and fingerboard (traditionally, the thinking being to expand and contract in the same direction of the sides; up and down). In this photo I have drawn a double-headed arrow indicating the direction the neck block will expand and contract due to moisture variations. Let your imagination be your guide, and consider what may occur should the neck block ever “swell”! No one asked, but I believe the primary culprit in the soundboard/soundhole shift is actually the soundhole itself! A 4 inch diameter hole has been cut into a plate supporting more than 200 pounds of pressure/tension. What could possibly go wrong? The fact that soundboards having no soundholes (or significantly offset soundholes) do *not* experience these splits is evidence enough for me. Of course, knowing that doesn't resolve the problem. Reinforcing the entire upper bout, with a focus on unifying the soundboard (above the waist), the back, the neck block, and the sides into one unmovable mass is what resolves the problem. But that is a topic for another article. In an effort to stave off the inevitable, the bridge had been shaved (more than once). It would have to be replaced. A little heat, and this bridge lifted off easily. 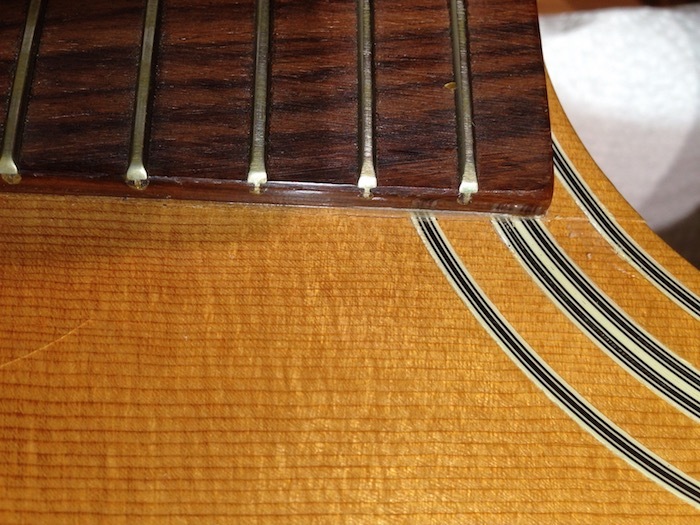 The Brazilian Rosewood fingerboard had one too many planings and sandings (during re-frets and a re-radiusing or two) and could use replacing. If I recall, this one had suffered many finger divots over the decades, more than I remember on my other guitars. 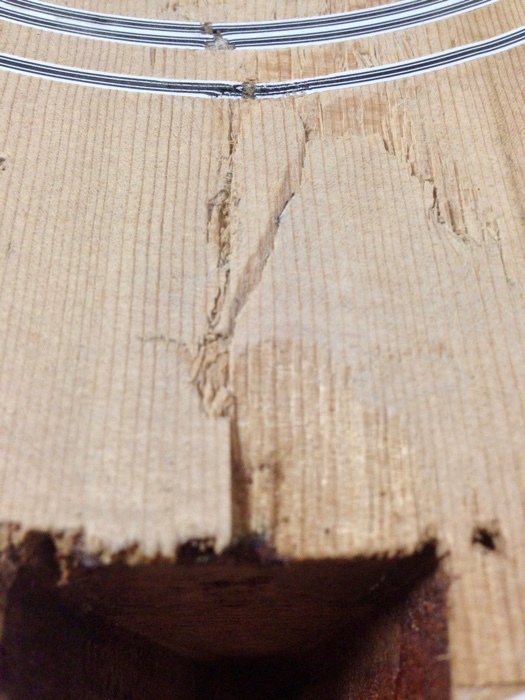 These worn, shallow gouges are typically a result of some combination of repeated fingernail and/or string contact, and/or a softer fingerboard material. They don't technically impede playability as much as they are unsightly. They can be filled (under certain conditions) or the board can be leveled by planing or sanding. Over time, if enough material gets removed, eventually the whole thing will need replacing. As I would be replacing the bridge, anyway, mating it with a new fingerboard would breathe new life into the instrument. It was time to take off the neck. 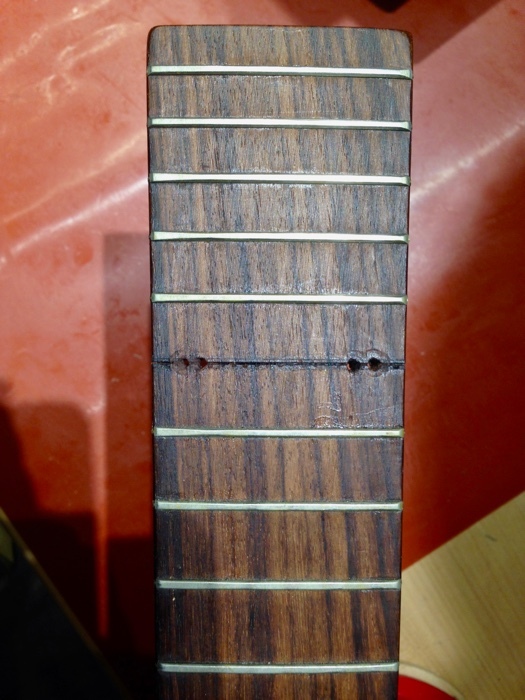 I removed the appropriate fret and drilled an angled hole through the fret slot, hoping to emerge in the recess between the dovetail of the neck and the mortise of the neck block. I missed the cavity, burying the drill in solid wood. I tried it again on the opposite side of the fingerboard, adjusting the angle slightly. I missed, again! Refusing to be beaten, I moved back to the original side, starting the angled hole closer to the center of the fingerboard, and SUCCESS! I repeated a second successful hole on the opposite side. I like to apply steam to both sides of the dovetail, instead of concentrating the heat on one side. Additionally, the second hole provides for an egress for any water, an inevitability as the steam cools inside the guitar. If you can hold the instrument fretboard-side down, you can prevent the pouring of water into the body - a definite no-no. If you have one of those guitars with visible white rivulets of powdered residue down the inside of the back and/or sides, you know what I am referring to. Using a jig that presses against the top rim of the body while, simultaneously, pressing against the heel cap (I think of it as my reverse steering wheel puller), I pushed the neck up and out of the socket it was glued into. And I experienced another misstep. Note that, as substantial as the necks on these Guilds are, the neck heels can be surprisingly thin at the heel cap, not leaving much to push against. In the days before CNC, all guitar necks were made by hand utilizing some combination of sawing, carving, sanding or routing. Not all hand-made necks were of identical measurements. Some of these Guild 12 string necks had thicker heels than others, and this one was pretty thin to begin with. Upon adding serious heat in the form of steam, and applying sufficient pressure to the end of the heel, guess what happened? 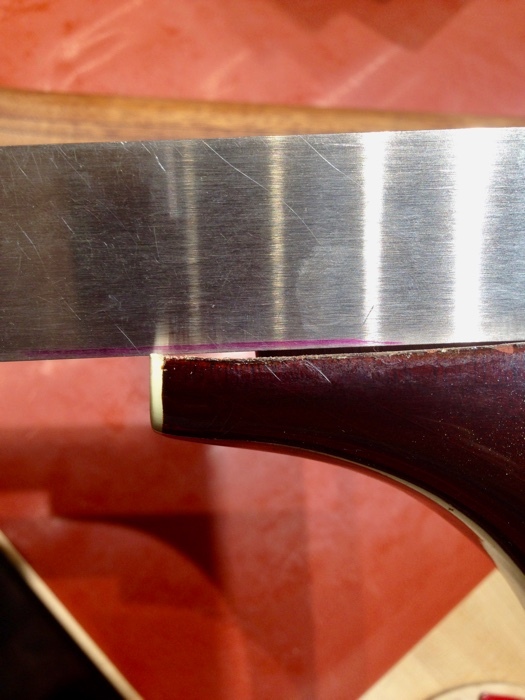 The wood of the neck heel, right at the heel cap, compressed and curled, actually de-laminating slightly. Now that it had curled, I had to make a decision. I could re-cut the heel and thin it even more. I could attempt to re-shape the heel, reversing the steam process, and risk greater damage to the neck. Or I could overreact entirely and re-make the neck. I opted to take the easy way out and re-make the neck! (LOL) To be fair, I had thought about doing this for several years in order to significantly lighten the neck. As you may be aware, Guild 12 string necks of this era were constructed using twin steel compression rods. Apart from the discussion of the pros and cons of adjustability, they are heavy necks! This would also give me a chance to document the dissection of one of these necks, something I realized I had never done. The fun didn't end there, however. As the fingerboard extension lifted off the top it took a chunk of the top with it. That can happen if I am being overly aggressive in trying to pry off the neck and have not applied enough heat. But this one was suspicious: it appears there is some serious grain runout, and the piece that broke off followed the grain. It is unfortunate, as I need to either fill or cut out and replace that missing section. But it is also of no real consequence, as the new fingerboard (extension) will be glued down over it. There is often a surprise waiting beneath these dark tinted lacquer finishes, and this guitar did not disappoint. Lo and behold, the underlying Mahogany is quite lovely! I can already envision a new finish on this guitar that showcases that Mahogany. The body of the F-212, three sizes down from Guild's largest body, is quite heavy. Weighing more than 3.1 lbs, it is a testament to the Guild legacy of being over-built (more wood is used than is needed) that accounts for it's unique sound. By contrast, my own jumbo guitar bodies, larger than this Guild, weigh a mere 37 oz. I intend to reduce some material from both the soundboard and the braces which will result in a bit livelier 12 string.